Got a Jeep? Then you need some cargo space! PAKMULE Sway-Back can add nearly 12 square feet of cargo space to your vehicle in less than a minute! Featuring the same burly TIG welded quality and huge size as the original, but with a lower rail height to accommodate 35″ spare tires, swing open doors, and other space restrictions above your receiver hitch without needing a hitch extension! Like the original, the Sway-Back is 100% aluminum, and features our locking, anti-wobble connection to keep your gear secure no matter where you ramble. And it looks badass too! Love the Pakmule Swayback. Fit was perfect on 2018 Wrangler JL with 35″ spare tire. Holds my YETI 160 with plenty of room to spare or cargo carrier with YETI 55. Light weight and sturdy design. Don’t have to worry about using hitch extension anymore with fully loaded YETI 160. Great customer service too! Couldn’t be more pleased with this purchase. Looks great too! After selling my F150 for a Land Cruiser, I need extra storage for hunting trips. I have owned my Pakmule for almost a year and love it! I’ve used the Swayback now on a few adventures and couldn’t be happier. It’s low profile enough so it doesn’t interfere with the spare tire on my Jeep JLU Rubicon, or is at home on the back of my RAM truck. I’ve loaded it up with multiple Orion Coolers in a few sizes — a couple Orion 65’s side by side, or you can line up 4 Orion 45’s turned sideways. It’s light and easy to remove and install by one person. Highly recommend. The swayback is the perfect choice for the new mercedes sprinter.I store our Coleman road trip grille in a 48 gallon Actionpacker and carry it along with a 55 quart bear proof cooler and still have room for camp chairs that store in their own cargo bag.I will be adding more MULEstraps, they also are the toughest I’ve found. I can’t imagine life without with Pakmule Swayback! It’s a perfect fit for my Rubicon and affords me so much extra cargo space — I put my large cooler and gear on there almost every weekend. It also gives me an comfy, low to the ground place to sit down and put my boots on, rig my rod or ready my gear when out in the field. It’s easy to put on and take off and the light weight allows me to hang it on the garage wall when I’m not using it. Customer service is outstanding as well when I emailed with some questions. Highly recommend. This is by far the best there is. Hands down the best material, construction and craftsmanship you can find. I wouldn’t pack my gear on anything else! PAKMULE’s hitch basket was developed for the outdoorsman who obsesses over high quality, functional gear . Other carriers on the market were clumsy, heavy, and difficult to use, so we made our own. And its aluminum construction makes it lightweight and easy to carry. 100% welded, PAKMULE doesn’t go together with a bucket of bolts when it arrives. Nope, it arrives fully TIG welded and ready to travel, while remaining resistant to every environment you’ll encounter. Winter slopes of Silverton for some back country runs? No Problem. Coast of baja chasing rooster fish in the surf? Bring it on! PAKMULE can take it all, and still look great doing it! Once installed, the innovative locking, anti-wobble connection takes over to keep your PAKMULE stable and secure for the long haul. 100% Made in U.S.A. by craftsmen who take pride in every detail. 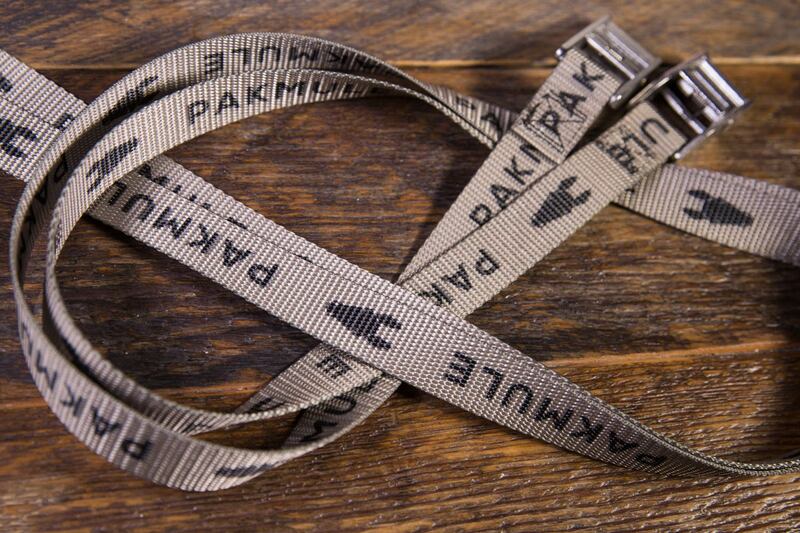 When you buy PAKMULE, you know you are supporting American jobs, and American families. Threaded shaft and a stainless bolt prevents your basket from dancing while you’re driving. Includes a keyed lock. Got a Jeep? Then you need cargo space! PAKMULE Sway-Back was designed specifically for you! 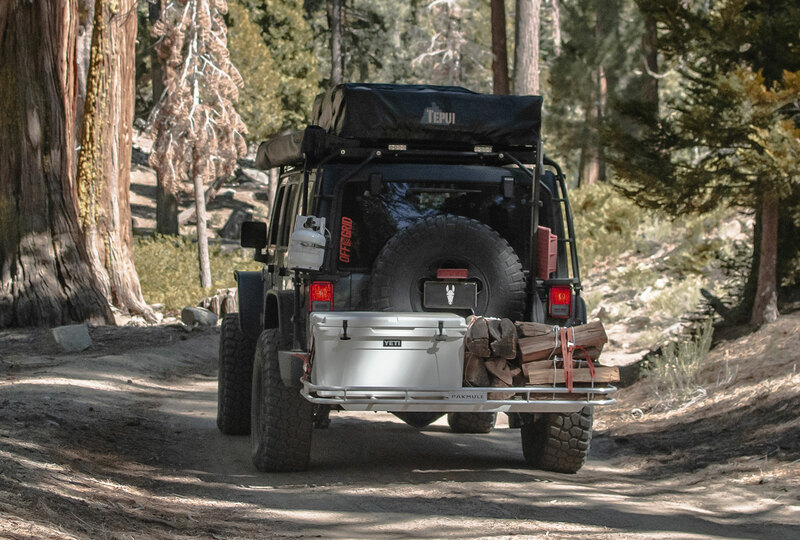 The low-rail allows you to install the PAKMULE under your spare tire, and still have enough space to load a couple 65 quart coolers across the back! Need to swing open your rear gate? Take your coolers off, and swing it open. No need to remove your PAKMULE! *If you have an aftermarket 2″ receiver, or a spare tire 35″ or larger, double check your clearance dimension. To fit, the PAKMULE Sway-Back needs 3 3/4″ from the upper inside wall of the 2″ receiver, to the bottom of your spare tire. If you have any questions about fit or access, please contact PAKMULE before ordering.